John Winans Clark, one of the two younger brothers of Rev. David Clark, was born in New Jersey January 17, 1779. At the age of 20 he went with his brother to Bourbon County, Kentucky. There, on February 15, 1805, he married Ann “Nancy” Isgrig. Her interesting ancestry will be the subject of another post. 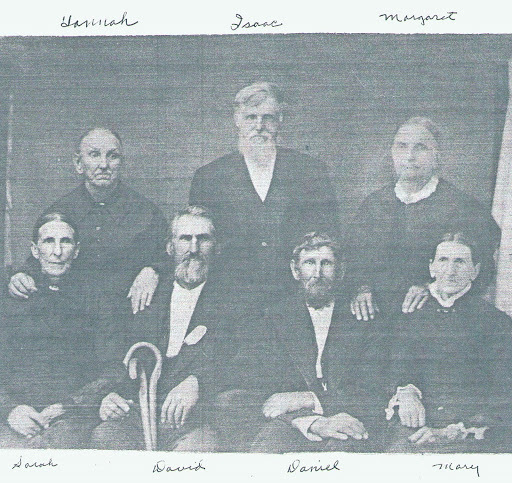 Three children, Hannah, Margaret and David Ward, were born in Kentucky before, following his brother, they moved to Miami County, Ohio, where six more children were born: Daniel Isgrig, Phoebe, Nancy, Isaac, Sarah Winans and Mary French. Nancy died before they left Ohio, again following his brother, in 1838. In 1838 they settled on son Daniel’s land in Yankeetown, Laenna Township, Logan County, Illinois. 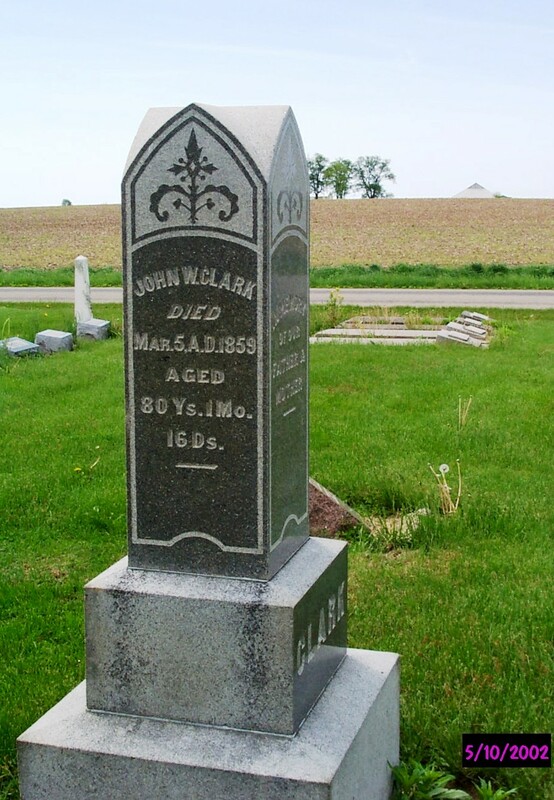 John died on March 5, 1859, and is buried in Laenna Cemetery. See Graveyards of South Logan County for his stone and military service. This picture is reputed to be the adult children [except for Phoebe] of John Winans and Ann “Nancy” Isgrig Clark. Since Hannah died in 1866 then it is a very old picture, taken no later than early October 1866. Or perhaps it is not Hannah but Phoebe and it was taken when their mother died — all are wearing black. Ann died December 8, 1867, and Margaret died two weeks later so the time frame is small but possible. John Winans Clark was a great grandfather of Lida. John Winans Clark was born in Somerset County, New Jersey, in 1779, traveled to Kentucky and eventually Illinois, and died at Yankeetown, Logan County, Illinois, on March 5, 1859. He is buried at Laenna Cemetery, Chestnut. Yankeetown is long gone but once was about where he is buried. Along the way John Winans Clark served in the War of 1812 in Captain Jeremiah Martin’s Company, Kentucky Mounted Volunteer Militia, mustering in on August 31, 1813, at Newport, Campbell County, Kentucky. Mary Payne Barringer, one of his descendants, will oversee the June 13 ceremony dedicating the official US Daughters of 1812 plaque is placed on his grave. More on John Winans Clark at Ancestor Hunting. My ancestors mostly came from the British Isles to the new world. However, there was a Frenchman [and woman of course] in there. Francois Lucas, son of Jean Lucas and Elizabeth Rollaire, was born August 8, 1663, and baptised in the French Reform Church in Otterberg, Germany, on August 12. The church, many of whose records survived to be filmed by the LDS, was comprised of French Huguenot refugees. On November 9, 1688, in that church, he married Marie Baudouin, daughter of Arnolt Baudouin and Marie Menton. The religious freedom began slipping away during the Palatinate War of Succession and subsequent wars which ravaged the country and left hunger and destruction in the wake of the invading armies. In 1709 residents of the Palatinate began fleeing up the Rhine. The first group arrived in Rotterdam April 19. We don’t know if Francois and his family were in that group but we do know that Francis Lucas, age 46, cloth & linen weaver, his wife, sons aged 17 and 11 and five daughters aged 19, 8, 6, 3 and 3 were in the first party to arrive in London by May 3, 1709. Also in those earliest refugees were ancestors of Elvis Presley and Jimmy Carter. About 3,200 Palatine refugees boarded 12 ships in the Thames which left London in December 1709 for New York. About 470 died on the voyages. Whether Marie Baudouin died in London or on the voyage is not known. The twin girls and the eldest son also did not arrive in the new world. We do not know their names. The refugees were bound for New Rochelle, New York, courtesy of Queen Anne of England. Francois, however, ended up in New York City where, on August 9, 1711, he married a widow named Elisabeth Engeler. By July 29, 1718, his son Franz was in Raritan, Somerset County, New Jersey. Franz married Jannetje Aten and on February 20, 1723, their daughter Maria was baptised in the Reformed Dutch Church [later First Reformed Church] in Raritan. Records of Francois after his marriage disappear until November 1741 when he is Somerset County, New Jersey, presumably with Franz. There is no more. 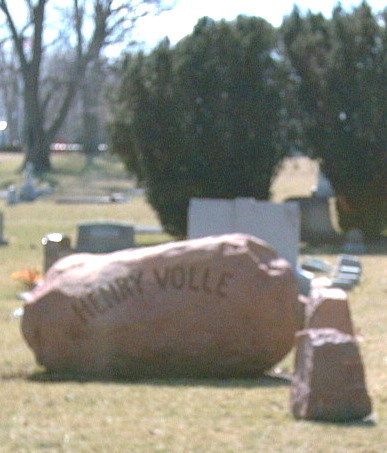 This the stone, literally, for Henry Volle at Mt. Pulaski Cemetery. Henry was born September 7, 1874, and lived for 92 years until October 3, 1965. He and his wife Margaret Horn had three children. The children grew up and moved away. I have no idea why he chose this very large rock. Lida died before I was born. A couple great grandmothers hung around until I arrived. The one I knew most of Lillie Margaret Wood Ryan. Lillie had a long hard life. She was a daughter of Berryman B. Wood. Her paternal grandfather was Solomon Wood, 2nd Coroner of Logan County, Illinois. Her great grandfather was Abraham Lucas saw Revolutionary War service and whose proven line goes back to the Huguenots in France. [Unproven and somewhat creative reports go to Charlemagne.] The Lucases arrived in America in 1710. Other early ancestors were Quakers, arriving on the second voyage of the Kent. On her mother’s side she was a great great great granddaughter of the same Abraham and Marcy Kelsey Lucas. Marcy’s father served in the Revolutionary War and her Kelsey ancestors arrived in New England in 1631. As previously mentioned, Berryman B. Wood was not a great provider. While the family was in Kansas for a few years Lillie met Edward Daniel Ryan, son of a neighboring farmer, and they married. When her parents returned to Illinois the newlyweds remained. That went sour fast. Apparently there was a major disagreement over the religion of their first child, daughter Sarah Catherine. Lillie came from a long line of early adopters of the “new religion.” Daniel and his family were Catholics, the religion her ancestors left. His parents came from Ireland as toddlers. Apparently they failed to discuss this prior to the marriage. There was no compromise. In the 18 months between their first and second child the couple packed up a covered wagon and moved to Mt. Pulaski, Logan County, Illinois, where Lillie’s family lived. They never saw his family or any relative again although we know he received correspondence from his mother. His father died within two years of their departure. Lillie and Daniel had 10 children, eight of whom survived childhood. They never had much. Edward took up drinking although he worked every day there was work. According to my grandfather, who never had a drop of liquor in his life, his father-in-law put in a good full day’s work every day and closed the bar each night before rolling home to begin all over again. In 1950, a few days before Christmas, Daniel died while exchanging gifts with his youngest daughter. He was 85. They buried him on Christmas Eve beside her parents and in the shadow of her maternal ancestors. Shortly thereafter Lillie took to her bed. For a few years she got away with it, her children and grandchildren coming in to cook and clean. Eventually she went to the Christian nursing home. On Christmas Eve 1956 Lillie died at the age of 85.